I've often felt Melie Bianco's favored synthetics look a bit cheap, but there are no such worries here. Less is more when it comes to synthetics. In small doses we don't register the glossy finish and stiffness of this manmade material. So Melie Bianco's lazer-cut flowers aren't just pretty; they're also a way to hide the hobo's cheap and cheerful fabric. The coordinating silk lining peeks through the petals and leaves, creating a look with volume and springtime style. Those pearl-esque handles really let the Lily down though. The spheres are so chunky, especially around the top of the bag; they don't really gel with the Lily's delicate cut-out design. I could forgive the confused look if these straps were comfortable, but these hard beads almost certainly won't be. Melie Bianco has gotten it right inside though. The Lily is generously sized and filled with handy open and secure zip pockets. You'll have space for everything you need to carry, and a place for everything as well! 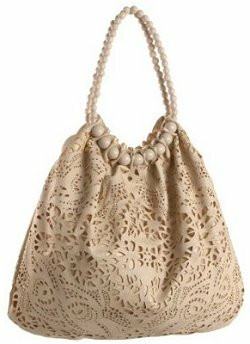 I love the timeless appeal of this ivory colored bag, but if you prefer something more feminine look for the Lily in rose pink. The Jessica Simpson Karma satchel bag, a great alternative to this lazer cut-out bag.